On Tuesday, my family picked me up after work on the way to Meet the Spartans. This is a public event for families to shake hands and get autographs from members of our pre-season Top Ten ranked football team. Arriving at the stadium, we waited in line for some free football posters, full of plenty of white space for autographs. There were other family-friendly activities at the event. These lines were shorter than the autograph lines, so we decided to knock them off first. The autograph lines would still be there afterwards. We got our picture taken with the Rose Bowl and Cotton Bowl trophies from the last two years. Then we got some awesome pics of the boys in full gridiron regalia. He looks the part, but judging by his failure to pick his way through holes in the crowd, he’s going to need a good blocker in front of him. Posing for pictures makes football stars hungry. Since the concessions were being offered much cheaper than can be had at an actual football game, our next mission was to stand in line to get the kids pizza and fries. Watching the kids eat made the parents hungry. Another bout of standing in the food lines left everyone fortified and ready to go grab some autographs. But first the boys had to visit the spirit tent and pick out some officially licensed merchandise to need desperately. It’s nice they have team spirit, but until they get jobs their foremost loyalty belongs to Team Family Finances. One of the boys noticed people going down to the field. We couldn’t miss that opportunity, and worked our way through the crowd to a little, roped-off, paved strip, about five feet wide, behind the end zone. We milled about there, each boy tempting authority by letting the toe of his shoe creep over the pavement onto actual football field grass. Introducing your 2033 Heisman Trophy winner. Having toe-kissed the grass, it was time to go snag some autographs. On the way, we learned that if we hurried, we could go upstairs and check out the coaches’ booth and the press box. We scurried for the elevator and went up eight floors to the press level. It was an amazing view, even from the window opposite the field; we could make out the dome of the State Capitol. As we explored the press area, Mommy found a wireless phone charger. Being a tireless devotee of cellular communication, she had to figure out how it worked with her phone. I chased the kids around the press box for a while, returning to find her the unofficial demonstrator of the device to the curious and the low-batteried. Coming downstairs, we found we’d cleverly outwaited the autograph lines. They were down to nothing, mostly because the players had gone. But we still had some nice posters. Nobody came out of there with posters fresher than ours. How many autographs did we get? How many players did we even see? But we ate like superstars, we touched extra special grass, and we charged our phone like we owned the place. It was a pretty special day for young hearts. 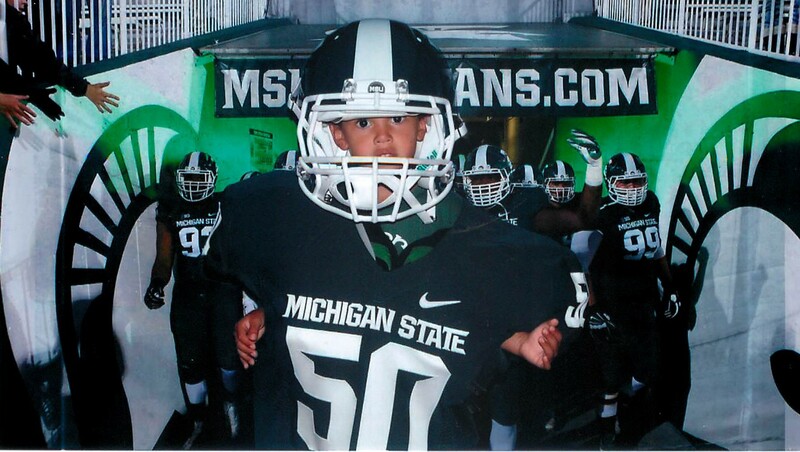 This entry was posted in Outings and (Mis)Adventures and tagged autographs, children, family, fatherhood, football, humor, kids, MSU Spartans, NCAA, sports. ← Is the sibling who was mean to you in this courtroom today? Haha!! “and we charged our phone like we owned the place.” That was so funny! I’m sorry that your day didn’t quite give you what you were expecting, but it also sounds like it turned out to be so much more. 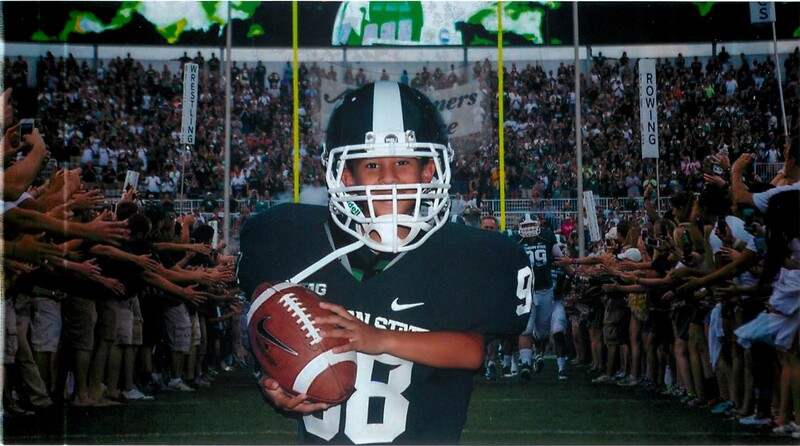 What a fun day and great pictures of your little football player in the making too. Nobody cried over not getting autographs so all the fun we did have was just bonus; worked out for the best. Everybody had fun, and that’s what matters in the end. You said it! Both things. He’ll be unstoppable once he can reach the ball around the uniform. Wow, that was some night. Who cares if you got autographs, you got your jitterbug flip-phone charged, and that’s all that matters. 🙂 Those pics are fantastic. Your kids are absolutely adorable. If they’d had a charger for my Medic Alert bracelet, it would have been the perfect outing. Oh well, I settle for cute kids. If you’ve got a medic alert bracelet that needs a charger, you are misleading us all about the state of your current technological phobia. It’s trumped by my phobia of falling and can’t get upping. It’s that VIP feeling of being allowed to be somewhere that people like us aren’t usually allowed to be. Don’t worry, we’ll keep going. I don’t have a choice. As long as the event is free, my wife will have us there. I love when days are nice for unexpected reasons. With three little boys, “nice” comes in all shapes and sizes – most of them unexpected. Yeah, the autographs would only get lost in the chaos anyway. Better to run and play at will. They’d have to have stuck around until all of us learned how to write our names. But it would have been so totally worth it. Yup. Plenty of standing and waiting. That’s how you know it was a good time.